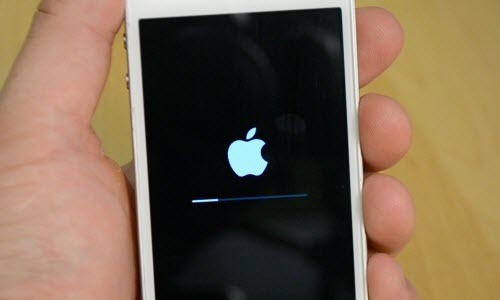 Losing data after rebooting iPhone is not rare and retrieve the deleted data after the iPhone rebooting becomes a wide spread problem. According to what the iPhone user described, he lost all the messages after the crash and reboot and badly want the messages back. Actually there are more than one way to retrieve the lost text messages. One is to retrieve directly from iPhone with the help of third part utility. Provided that the lost messages texts haven’t been overwritten and erased, you can scan your iPhone and retrieve the lost messages selectively from iPhone successfully. 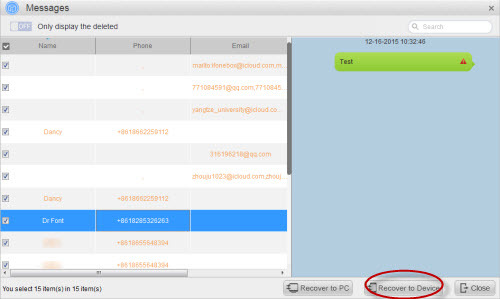 Here I would like to demonstrate how to recover the deleted text messages with a renowned and specialized iPhone data recovery software – iFonebox. Please note that iFonebox is available for both Windows and Mac, please choose the right version to download and install. > Choose messages to scan selectively by clicking on the icon of Messages from the interface listing all the supported data categories. > Wait until the data scanning and analyzing completes. > Preview the exported messages and select what you want to recover to your iPhone by clicking on “Recover to Device”. If you have backed up your iPhone to iCloud or to your computer through iTunes, you should have iCloud or iTunes backup file. You can either restore your iPhone with iTunes or iCloud backup file to get back the deleted text conversation or scan the backup file with iFonebox to extract the messages and transfer back to your iPhone. Here I am not going to talk about the details about restore your iPhone from iCloud or iTunes backup, please refer to Apple Support community and our guide about how to export messages from iCloud or iTunes selectively. How To Retrieve Text Messages Missing While Upgrading from iPone 5s to 6s? How To Transfer Messages From iPhone 6s to iPhone 6s Plus? How To Restore Only Contacts, Notes and Messages After Factory Reset? This entry was posted in iPhone, Messages and tagged iPhone, lot messages, messages, reboot, restore deleted messages from itunes backup, retrieve text messages lost after reboot by IosdroneD. Bookmark the permalink.